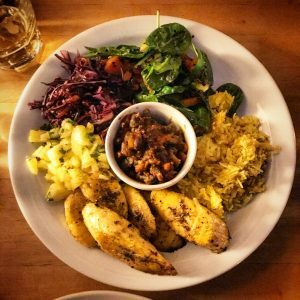 A perfect vegan dining experience – ideal for cold winter nights when you yearn for a hearty portion of warming soul food. 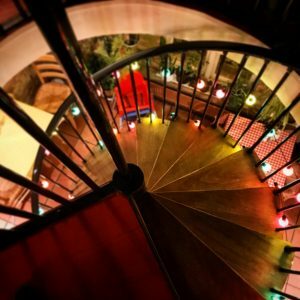 We’re suckers for a pretty spiral staircase! Our vegan adventures continued at the oasis of calm that is Cafe Van Gogh on Brixton Road, a social enterprise which reinvests its profits back into work with the local community through, amongst other things, on-the-job training & food nutrition workshops. Well, happily for such a well-meaning and good-hearted project, the food tastes GOOD! Better than good in fact, pretty damned amazing. 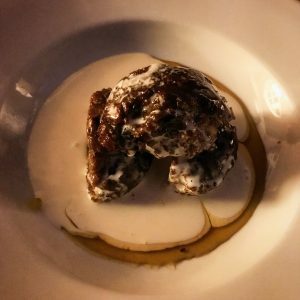 Make no mistake – this is not haute cuisine, fine dining, smear-of-artichoke-puree-and-a-tiny-mound-of-truffled-fig-in-the-middle-of-a-crazy-plate food. This is vegan soul food, homely and rib-sticking, the kind of food your mum would have cooked if she wasn’t horrified by the very idea of a meat-free diet! On our weekday evening visit, we went straight for the Large Plates! 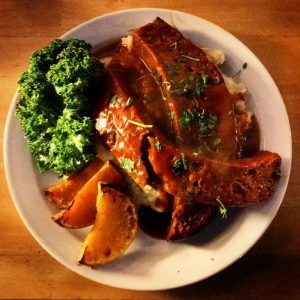 A huge portion of Sticky Seitan IPA Ribs – two giant-sized slabs of well-marinated seitan sat atop a ‘creamy’ vegan mash perfect for mopping up the sweet and sticky BBQ sauce – could probably feed two. Oh, and for some texture diversity, there were some crispy half-moons of roasted squash on the plate too, pretty AND tasty. Of course, we did not share, so we can also tell you about the Jerk Plantain, which arrived looking a little like the Thali’s we tucked into elsewhere a few days back. Here, zingily-spiced chunks of plantain arrived on one segment of a round plate which also offered up rice, smokey black beans, pineapple salsa & salad. The whole dish was a flavour explosion – even the salad, which could just have been a few simple leaves, was imaginative and exciting. We ordered sides. Of course we did. A larger salad to share – leaves, grains, pulses, shredded vegetables, all easy on the eye but, more importantly of course, also on the taste buds – and a dish of Baked Paprika Homefries, cubes of delicately spiced, soft on the inside, crispy on the outside potatoes with a super-tasty homemade ketchup on the side. We were happy bunnies, full to the brim… but we just couldn’t resist the lure of the Sticky Toffee Pudding. Oh, what a thing! The STP was delicious – a perfect balance of chewiness, melt-in-the-mouth lightness, crispy edges and a deep, intense, toffee flavour enhanced by lashings of hot toffee sauce. Topped with a liberal pouring of oat cream, this pud could do no wrong – we ate the glorious, gooey bowl of goodness in what the waiter described as “record time”! A perfect vegan dining experience then. Ideal for cold winter nights when you yearn for a hearty portion of good, warming soul food. Oh, and they serve Asahi too. Win.